The Lando Bluetooth custom speaker with your logo - affordable with a great sound. 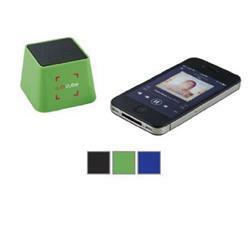 Power-up and listen to your favorite music with this quality Bluetooth Speaker! This small form speaker delivers great sound and plays music or other audio content from any Bluetooth enabled device or via the 3.5mm audio input, making it compatible with just about anything. Rechargeable speaker is perfect for travel or office setting. With your logo on it, it's a great promotional item for you company or event. Bluetooth working range is 10 meters (33 feet). FREE RUSH AVAILABLE! Production Times Available: 10 to 15 working days.